This post is sponsored by Tillamook. Tillamook Yogurt is farmer-owned for over 100 year. They use only natural ingredients - only real fruit and no high fructose corn syrup. All ideas and opinions are my own. 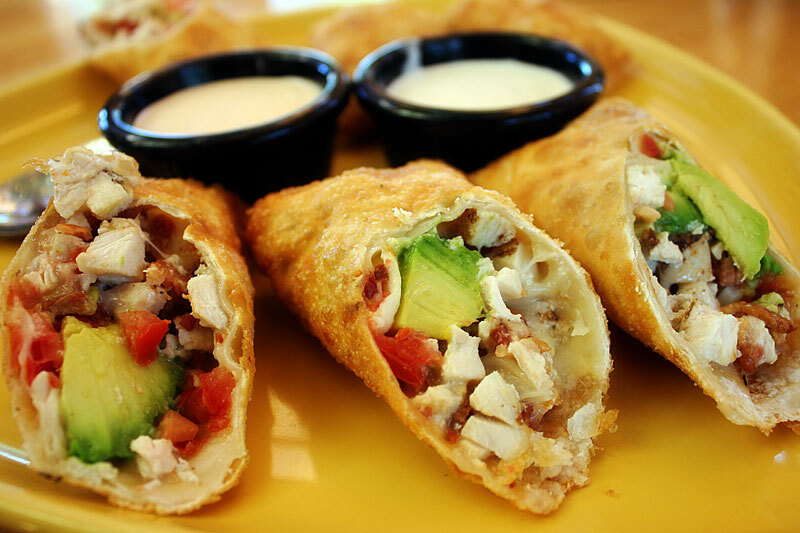 As many of you surely realize, I love food. And though I normally prefer to write about restaurants because hey, no dishes and the food is already presented all nicely for me, I do eat the majority of my meals at home like a normal person. And whenever I am going grocery shopping, there is seriously nothing that gets me more excited than Tillamook products. The first time I saw Tillamook ice cream at my local grocery store, I literally squealed with joy and immediately called my mom, who lives in the PNW and gets to enjoy their products to the fullness. Shortly after the cheese and ice cream, Tillamook yogurt began appearing on the shelves, and I thought that life here in Utah might not be so bad after all :) I was thrilled to get to work with one of my favorite food companies of all time - I can't even count the number of times I've visited the Tillamook cheese factory, and I am highly loyal to all of their dairy products. 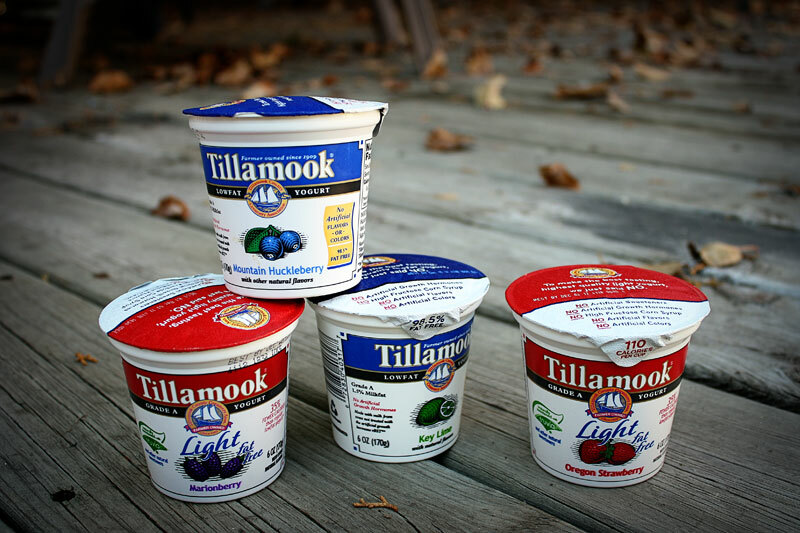 Tillamook recently has added a line of "Light" yogurts, which is even more exciting than their normal flavors! Like all of their other yogurts, there are no artificial sweeteners, no artificial growth hormones, no high fructose corn syrups, no artificial flavors and no artificial colors - it's all-natural in there, and all-delicious, if you ask me. Most light yogurts are sweetened with artificial sweeteners that leave that awful aftertaste, but the Truvía® they use with Tillamook yogurts tastes nearly the same as the regular yogurt and there is no nasty aftertaste! Low calorie (110 calories per yogurt) and great taste? Win win. I would probably say that my all-time favorite flavor is good old Oregon Strawberry (boring, I know, but I love the fresh strawberry chunks in there), and my little brother practically lives off of the Key Lime flavor at home in Washington. They have a bunch of other fun flavors like Baked Apple Pie, Pomegranate Blackberry (so good! ), Strawberry Lemonade, Mountain Huckleberry (probably my second favorite), Blueberry Açaí, and Country Orange Cream. I pretty much eat a yogurt every day for breakfast, and Tillamook is simply my all-time favorite brand. You can get Tillamook yogurt now at Macey's, Target, Winco, and probably other grocery stores nearby that I don't visit often, and I would definitely recommend you give them a try! 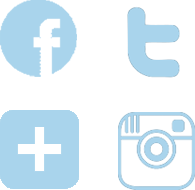 And to provide further incentive, you can print out a buy-one-get-one-free link below! Doesn't get much better than that. 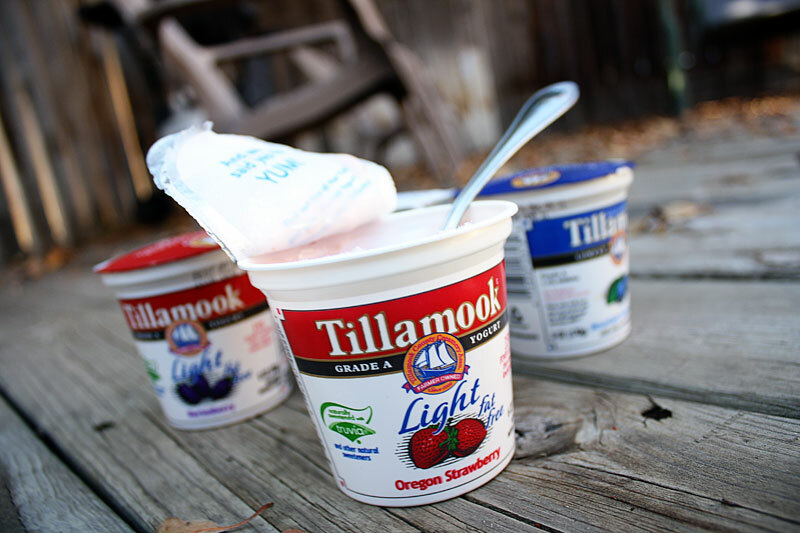 Have you ever tried Tillamook yogurt? What are you favorite flavors? 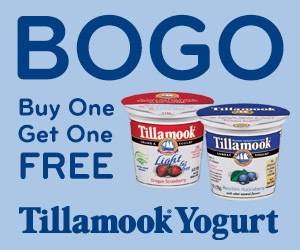 Click here for BOGO coupon! Okay, I know, I know, two taco places in a row... I can't help it! I love tacos, they are quick and delicious and inexpensive. We were driving home from shopping at those new dangerous outlet malls in Lehi the other night around 10, and decided that we were not quite ready to call it a night...and we wanted TACOS. Rather than stopping somewhere gross like Del Taco or Beto's (sorry to those who are fans...) we decided to stop at the long-anticipated Tortilla Bar - seriously, we've been following this restaurant since like April or something waiting for it to open! It was such a spur of the moment decision so I didn't have my camera - I apologize for the crummy phone pictures, but I just had to share this one right away! The atmosphere was fairly dark (once again, not amazing photos, I know) and industrial, with very limited seating. It's kind of fun because the hot kitchen is right out there in the open with a bar right where you can watch the chefs work their magic. I originally tried to order the gordita from their menu, but the server said that they weren't serving that tonight, instead I could get something the guys in the back call "chorizos" that has squid. It sounded interesting, so I decided to go for it! I'm pretty sure that chorizo is really a spicy Mexican pork sausage, which seemingly had very little to do with this meal, but what the heck. 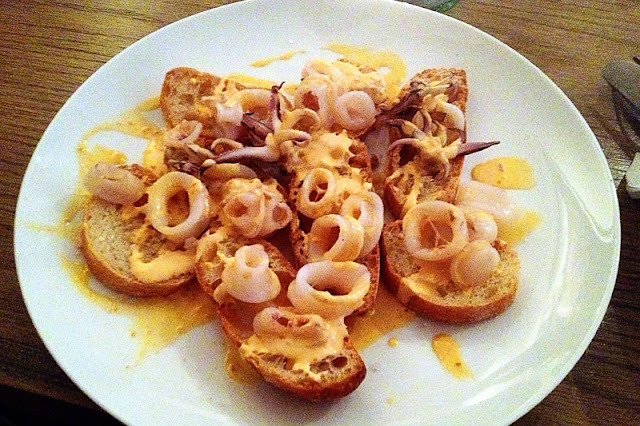 I've only ever had squid in a fried form as calamari, and here in an unadorned, very fresh manner, it was new and delicious! The squid was served on top of little slices of crispy baguette with a creamy and savory sauce. The only thing that was a slight turn off where the large bits of rock salt that were sprinkled on top - they were a little overpowering, but fortunately there were only a few. On their Facebook and Twitter pages, this restaurant keeps talking about being a food rebel, and this plate definitely lived up to that reputation - it was unlike anything I've ever had before, and was very enjoyable. 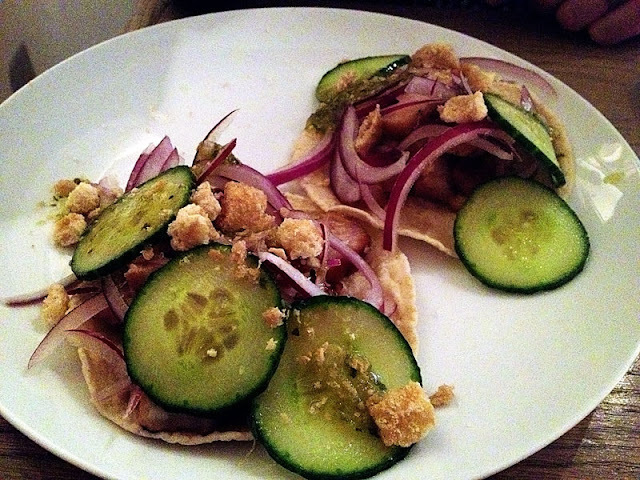 The pork belly tacos were a little more similar to food we've had before - a rich juicy pork topped with pickled, sharp onions, refreshing cucumbers and crunchy chicharrónes. The tortillas were clearly freshly made, tender with a real delightful corn taste. I think I may need to have a tortilla show-down between Tortilla Bar and Taquería 27...they were both so good! The tacos were a little difficult to eat without everything falling out - a typical problem of tacos I suppose, but I felt like if the cucumbers were cut up a little bit (maybe even in half), it would have been much easier to enjoy. Nonetheless, it was a perfect little late-night snack and definitely satisfied our craving for something unique and tasty. We weren't ready to quite be done with Tortilla Bar yet, so we went for the tres leches dessert. 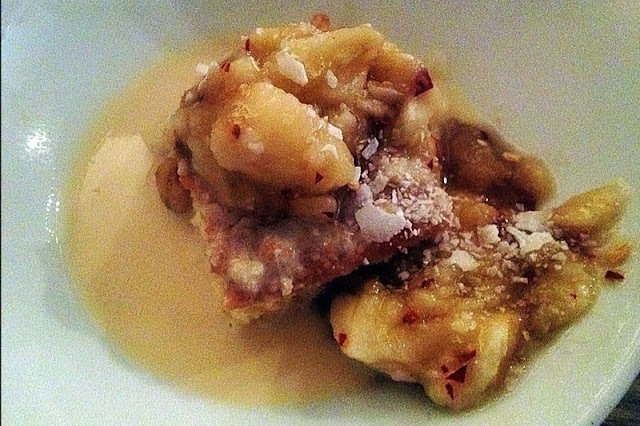 Not that you can really tell from the photo above, but it was a little square of soaked sponge cake with a banana topping, shaved coconut, and red pepper flakes! If you like milk at all and have never had tres leches, you are very much missing out on this sweet and satisfying dessert. It was a little disappointed with the small portion, but I guess since tres leches is very rich, you don't really need much to make an impact. I enjoyed the banana pairing, and the spicy red pepper flakes really gave it a fun kick, with a nice crunchy texture addition of the coconut. I thought it was absolutely delicious, and only regretted that I couldn't eat like four more of them! I am not sure if they really aren't open for dinner, and if they are really open all night long (I do not envy the person who has to work that shift!) 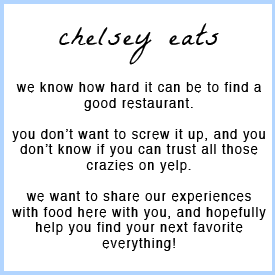 but it's a great place to get a unique culinary delight at pretty much any time of day! I definitely want to try their Saturday brunch, and don't worry, I'll get better pictures next time! I'm really excited because I have a lot of places to share with you that I've been lately - something about the holiday season coming up (and also finals season) has made me want to eat out all the time, so we've been to tons of restaurants lately! Though it was difficult to find (especially if it's snowing outside! 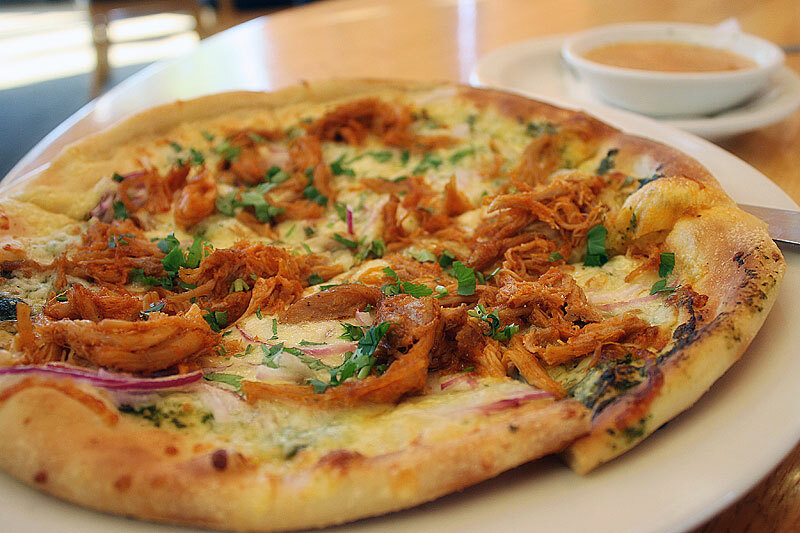 ), we stopped by Taquería 27 because I noticed they've been getting lots of press of Urbanspoon. We started out with some roasted guacamole which had highs and lows - though the guacamole was very good and given in a good portion, the flavor of the roasted peppers didn't really come through. 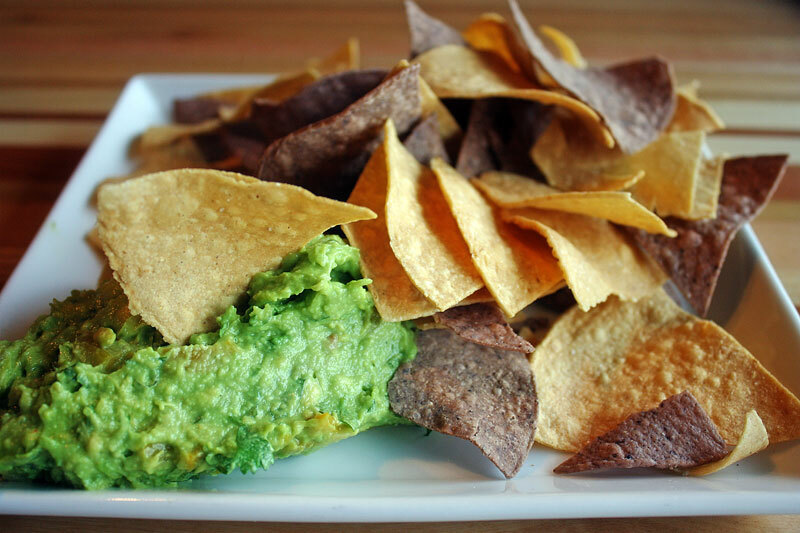 The chips were not very salted, which was a little disappointing, since they don't have salt on the tables, but overall we still enjoyed the guacamole, thought it was a good starter, and it was just the right size. Very fresh taste. 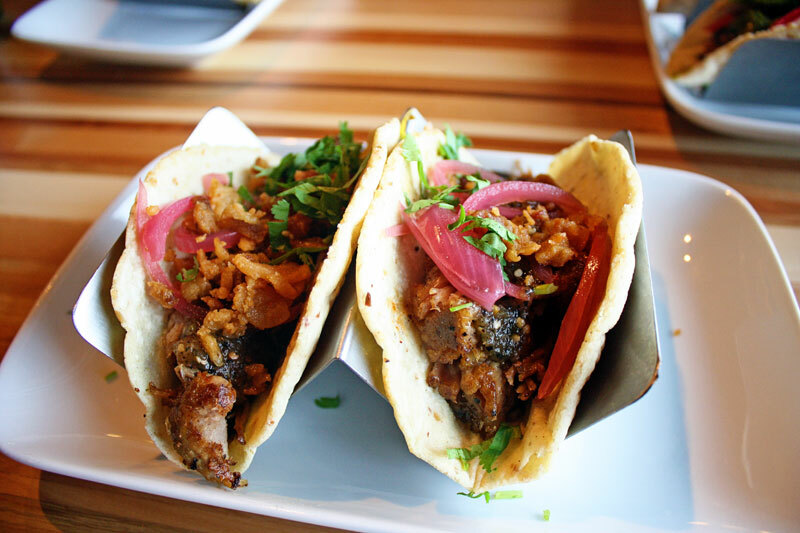 Of course we ordered some tacos for our lunch, starting with some more traditional carnitas tacos. The pork was very tender, which was a nice contrast to the crunchy chicharones, and I really enjoyed the flavor of the charred tomatillo salsa. The corn tortillas are some of the best I've ever had - they taste freshly made, are not dry at all, and add a wonderful soft flavor to the tacos. 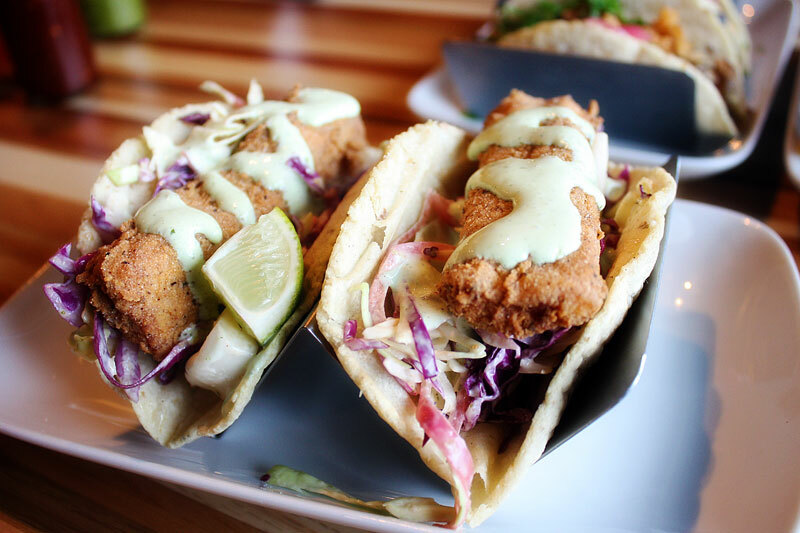 The fish tacos were my second favorite - a delicious crunchy slaw was paired nicely with the fried fish, and I thought the jalapeño cream sauce was very good. Only one of the tacos came with a little bit of lime, which really heightened the flavor, so it would have been nice if they both had the lime. The ono was a little overcooked, but still had a nice taste, fairly decent texture, and was overall enjoyable. These carne tacos were my absolute favorite. In so many Mexican-style restaurants we've been to lately, the carne asada meat always seems SOOOO dry. Taquería 27 wonderfully did not fall into this category - the carne tacos were succulent and flavorful, and I loved the chimichurri sauce with the savory meat. 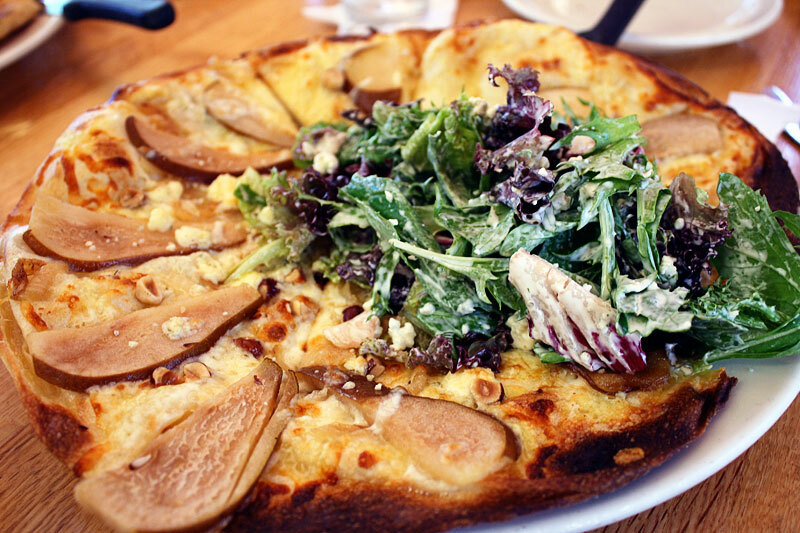 The avocado and radishes provided a delightful dichotomy of creaminess and crispness, and I wished that we had ordered 6 of this flavor! 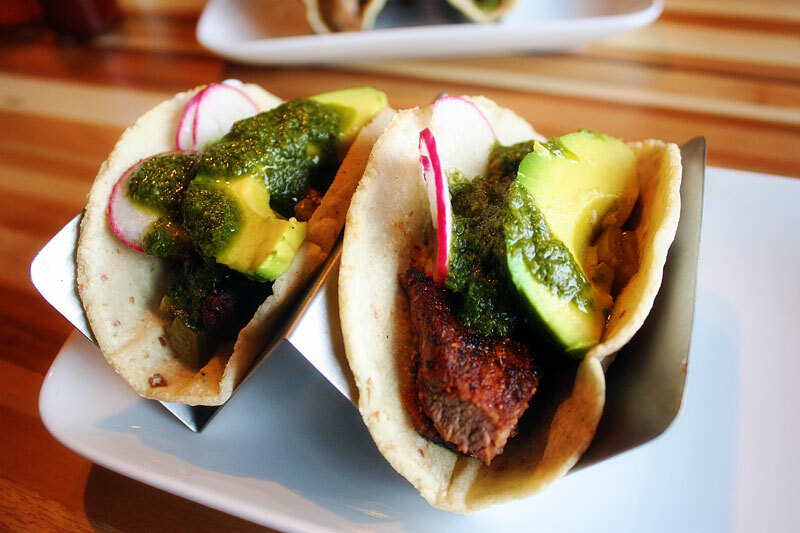 What You Should Do: I would definitely recommend Taquería 27 as one of our new favorite taco places in Utah! This place is a little expensive for tacos, so I probably wouldn't add it to the top of my list, but it was still pretty darn good. It was the fresh-made corn tortillas that really sold me - this place aims for the freshest flavors and they claim that they don't have a freezer or microwave! I think I would have to go shopping a lot more often without those two things, but it's great for eating out! After hearing so much about this restaurant, from people in my class and from Diners, Drive-Ins, and Dives, I knew it would be a good choice to take my friend, Brent, who was visiting from out of town. Unfortunately, he was scheduled to play in a soccer game later that day, so he went with a smaller salad. Normally I scoff at salads and would never buy one, but luckily this one proved to be worth it. 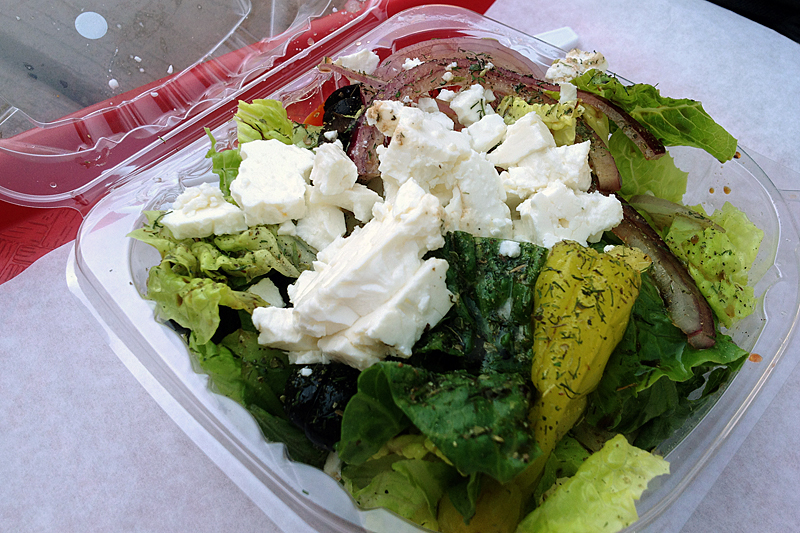 A true Greek salad with delicious chunks of rich feta cheese, vinegary onions, and plenty of flavorful dill. It was pretty substantial for a small side salad, and was just right for Brent that day. I decided to order the restaurant's namesake sandwich - if you're going to put meatballs in your title, they better be good! Moochie's is also famous for their creamy jalapeño sauce, and though I didn't know if it would really mesh well with my sandwich, I put it on half the sub, just to try it out! The meatballs indeed were delicious, just spicy enough with a tangy marinara sauce. There were three meatballs in the whole sandwich - they were huge! I think if I were to order this sandwich again, I would grab one of the plastic knives and cut the meatballs up a little bit first to make it easier to eat. The sandwich's bread was fresh and had a crispy exterior, and overall it was a delicious and very satisfying sandwich. Definitely worth all the hype! 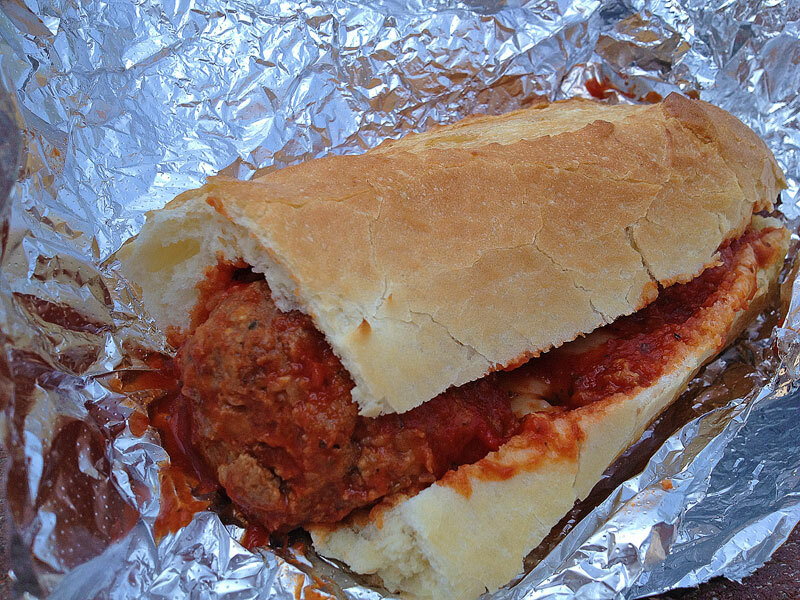 What You Should Do: I would absolutely recommend trying out Moochie's Meatballs, though I may say you should either wait until the weather warms up a little bit or plan on getting it to go. The inside of the restaurant is absolutely tiny, and although they have expanded some seating into the small building next door, it can get full very quickly. If you go during an off-hour, you should be fine, and even with the large number of customers, the service was very quick. I definitely will be back to try some of their other sandwiches, and hopefully they will be just as good as the meatballs!